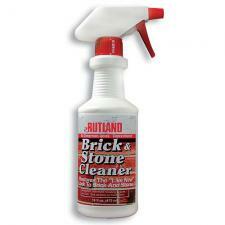 Rutland's Brick & Stone Cleaner is a safe concentrated cleaner to remove smoke residue, soot, and creosote from masonry surfaces. It will not harm metal, glass, or fiberglass. It contains an industrial-strength solvent to dissolve build-up, and a heavy-duty surface cleaner to penetrate and remove grime and greasy dirt with no dangerous acids.